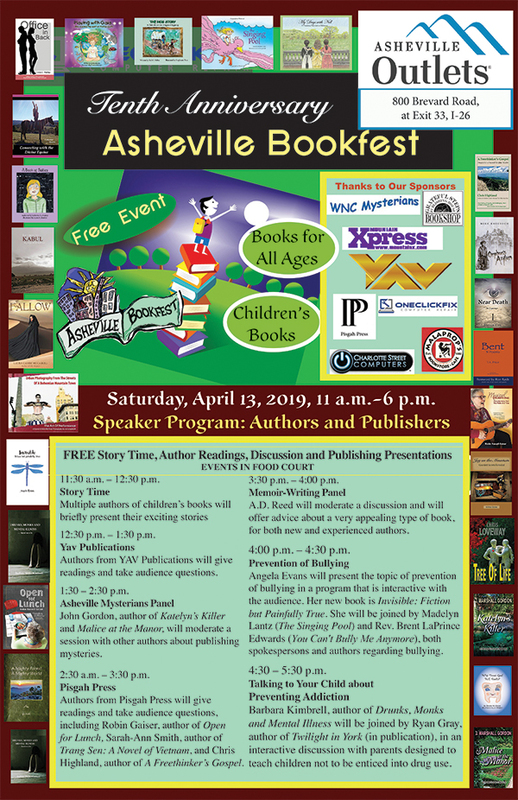 Pisgah Press will cohost Asheville’s annual book publishers’ fair all day (11-6) Saturday, April 13. This year the festival will be held at Asheville Outlets Mall. Grateful Steps Publishing is the host organization, along with YAV Publications, and numerous area writers will attend. Among them: Pisgah’s Chris Highland, author of A Freethinker’s Gospel: Essays for a Sacred Secular World, RF Wilson, launching his new murder mystery, The Pot Professor; Robin Gaiser, reading from her memoir Open for Lunch; and Sarah-Ann Smith, reading and discussing her acclaimed novel Trang Sen: A Novel of Vietnam. Editor-in-chief A. D. Reed (author of Reed’s Homophones) will also moderate a discussion of memoir writing.